Jun 6, 2018 • An international group of scientists from NASA, the European Space Agency (ESA), and universities and research organizations across the globe is working together to find the best atmospheric correction techniques for Landsat 8 and the Copernicus Sentinel-2 satellite series in an effort called the Atmospheric Correction Inter-comparison eXercise, or ACIX. Because Earth’s atmosphere is between satellites and Earth’s surface, making accurate measurements of surface reflectance with optical sensors involves accounting for any light scattered by the atmosphere. So better characterizing the atmosphere in terms of aerosol optical thickness and water vapor components at the time of a satellite’s observation is crucial for calculating surface reflectance. To fully understand how to improve atmospheric correction techniques, the multidisciplinary ACIX research team is comparing existing correction methods over selected test sites and then analyzing the aspects of each method that work best and what limitations each technique has (this comparison method was inspired by similar exercises done in the vegetation radiative transfer domain, known as RAMI). 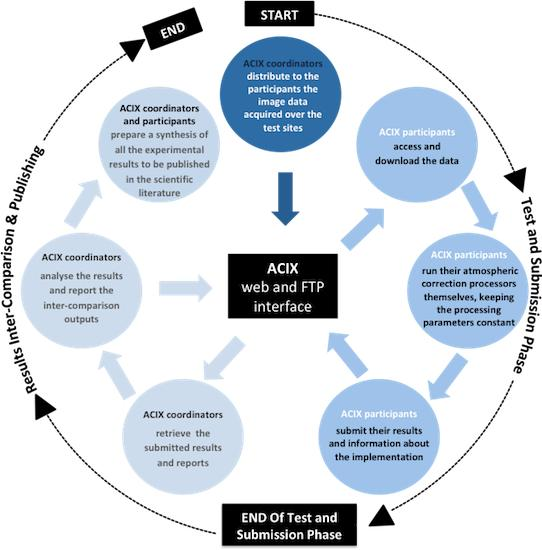 The information gained in this first ACIX stage is being used to improve algorithm performance. Initial results of this work were published in the journal Remote Sensing in February. The second stage of the project, ACIX II, is starting this fall and will address additional atmospheric correction facets as well as improvements for cloud and cloud-shadow filtering techniques. Doxani, G.; Vermote, E.; Roger, J.-C.; Gascon, F.; Adriaensen, S.; Frantz, D.; Hagolle, O.; Hollstein, A.; Kirches, G.; Li, F.; Louis, J.; Mangin, A.; Pahlevan, N.; Pflug, B.; Vanhellemont, Q. Atmospheric Correction Inter-Comparison Exercise. Remote Sens. 2018, 10, 352.